HOLYOKE, MA USA Jan. 8, 2019 – In 1895, William G. Morgan invented the game of volleyball at the Holyoke YMCA. 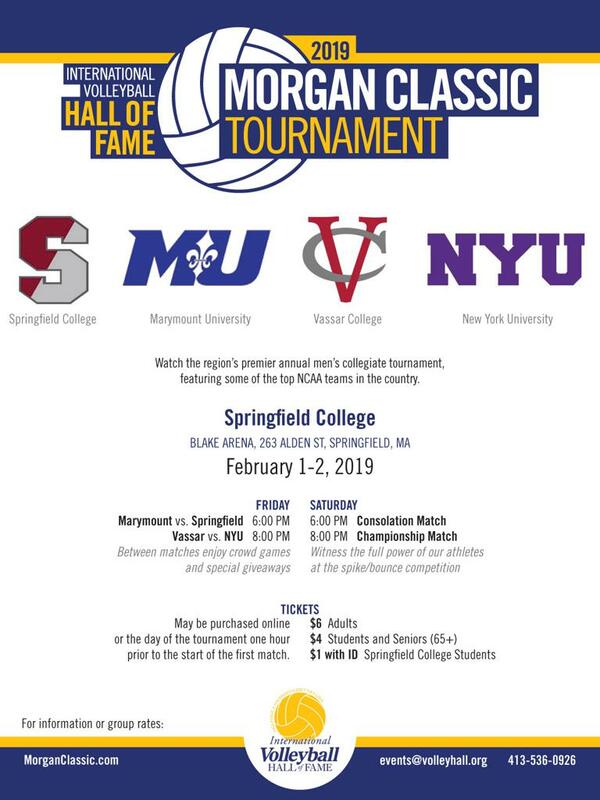 While he first named the game “Mintonette” it was given its official and more familiar name during its first public exhibition at a conference of YMCA Physical Directors held at Judd Gymnasia on the campus of the International YMCA Training School – now Springfield College. Match tickets cost $6 for adults and $4 for youth and students and can be purchased at the door or online here. The Morgan Classic Co-Ed Players Clinic welcomes all skill levels and has both youth and adult sessions. The unique clinic format allows attendees the opportunity to interact and learn skills from the players and coaches of the tournament teams. Additionally, the Coaching Clinic features educational sessions presented by each coach of the tournament teams. The fee for each clinic is $65 per person and includes one ticket to Saturday evening's matches – attendees that register and pay by Jan. 21st will also receive a free t-shirt. The fee for each clinic is $65 per person and includes one ticket to Saturday evening's matches – attendees that register and pay by Jan. 21st will also receive a free t-shirt. Show your support for the Hall and your love of volleyball by attending the Morgan Classic Tournament and participating in the Clinics. To register online for the coaches or players clinic or for information on the tournament, visit MorganClassic.com.